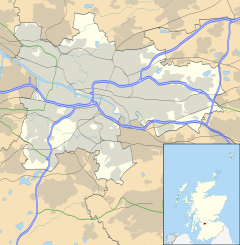 Govanhill (Scottish Gaelic: Cnoc a' Ghobhainn) is an area of Glasgow, Scotland. Historically part of Renfrewshire, it is situated south of the River Clyde between the Gorbals, Pollokshields, Strathbungo, Crosshill, and Queen's Park. The council ward has boundaries of Dixon Avenue and Dixon Road to the south, Victoria Road to the west, Butterbiggins Road to the north, and Aikenhead Road to the east. Govanhill had the status of a police burgh between 1877 and 1891 before becoming part of the City of Glasgow. The history of the area is linked to the Dixon family. A prominent ironmaster, William Dixon opened blast furnaces to the north of Govanhill which became known as Dixon's Blazes. A company village called Fireworks Village was situated on the site of the later Burgh of Govanhill. The village was built by Dixon for his workers, who worked in his Little Govan Colliery. The area itself was formed in 1877 and the main avenue that runs the length of it is called Dixon Avenue. Some of the local streets were named after the daughters of William Dixon Jnr: Daisy Street, and Annette Street. Allison Street street is thought to be named after Sir Archibald Allison, Sheriff Principal of Lanarkshire. Govanhill gained the status of an independent police burgh in 1877 , on achieving this staus a police office was set up off Belleisle Street. Cells for prisoners, tenements for constables, and stables were added . Govanhill shared a burgh hall with its neighbour, Crosshill; this building is now known as the Dixon Halls. Both burghs were absorbed by the expanding city of Glasgow in 1891. From the first days of the neighbourhood's formation, Govanhill has always been a popular settlement area for people coming to Glasgow and Scotland. The population has regularly changed and diversified as migrants have chosen to live in the area. Migration started with people from the Highlands and Lowlands of Scotland; from England (workers from Shropshire to carry new techniques at the iron works);  from Ireland; Jewish people fleeing persecution in Eastern Europe; people from the Punjab and other parts of the Indian sub-continent; Glasgow's new communities of former asylum seekers and refugees and – most recently – migrants benefiting from Enlargement of the European Union originating from Poland, Slovakia, the Czech Republic (2004) and Romania and Bulgaria (2007). The area has long been Scotland's most culturally diverse neighbourhood. Of the 15,000 people living in the neighbourhood, approximately 40% are from ethnic minority communities (2012), with Roma people from Eastern Europe making up 3,000–3,500 of the local population. This diversity is reflected in the local shops, the languages spoken in the street and in the people found locally. A social survey carried out by Govanhill Housing Association, identified 52 nationalities and 32 languages spoken within just 13 tenement blocks, within the area..
Govanhill was one of the few areas to avoid Glasgow Corporation's programme of 'Comprehensive Development Areas' in the 1960s. A total of 29 inner city areas were identified for complete demolition and replacement with new buildings, nearby examples being Hutchesontown and Pollokshaws. The existing communities were dispersed – normally to the new estates at the edge of Glasgow such as Pollok and Castlemilk, or to Scotland's new towns – e.g. East Kilbride, Cumbernauld. The replacement housing was typically high rise or deck access and non-traditional. Few community facilities were provided initially and little thought was given to the replacement of the elaborate infrastructure of shops, pubs and small businesses which were an integral part of the previous tenement structures. Some Govanhill locals did not like what they saw happening to other communities across the city and decided to take matters into their own hands. Based on early experience in Govan, a community based Housing Association was established in 1974, run by the residents living in the area. Instead of mass demolition, a steady process of improving the quality of the flats and installing modern amenities was undertaken. This was complemented by sensitive new building in gap sites. Govanhill is home to one of Glasgow's original Carnegie libraries, designed in the Edwardian Baroque style by James Robert Rhind. Instances of violent crime are 159% above the Scottish average with domestic abuse incidents and drug offences 45% and 73% above. Govanhill has long been recognised as one of Scotland's deprived communities and this continues to be borne out in SIMD 2012. All but 3 of the area's 12 datazones fall into the bottom 30% of all Scottish datazones. Of these 9 datazones, 5 fall into the bottom 15% of Scottish datazones, with 4 datazones in the bottom 10%. This indicates particularly acute deprivation in much of the neighbourhood. Govanhill is home to a thriving creative arts community, including Dance Factory Dance Studios in Calder Street, Twisty-Headed Man Company on Butterbiggins Road and a variety of arts activities taking place in Govanhill Baths. The Chalet in Dixon Avenue and Southside Studios in Westmoreland Street are both home to successful visual artists and other creatives. Since 2009, the area has had its own arts festival - Streetland, which usually takes place in early summer in streets and venues across the area. Govanhill Housing Association also organises an annual Fun Day for local residents. The Fun Day and Streetland Festival next take place on 6 June 2014. There is a vibrant voluntary sector in the local community with dozens of organisations active in the area. Considerable activity exists to improve the environment, engage young and old, promote integration, tackle addictions, develop the arts, provide education and develop opportunities locally. There are many opportunities to volunteer locally. At the local neighbourhood centre there is a considerable array of leisure and other activities which people can get involved in. Govanhill is also famous for its shops, which in themselves reflect the huge diversity of the area. There are a number of businesses supporting international connections – money transfer businesses, cargo services, travel agencies – as well as clothing and food stores for all nationalities. The area is also home to a number of traditional shops – cobblers, school uniform suppliers, cafes etc. – but planning approval has also recently been granted for a mixed leisure and retail development at the soon to be vacated bus garage near Eglinton Toll. The area is home to many faith communities, with churches, mosques and synagogues often in close proximity or side by side. Faith communities are often delivering significant community services as part of their core work and this activity often goes under the radar. Local churches are involved in delivering services to homeless, those in food poverty, children and families, street workers, elderly and those experiencing isolation and loneliness. Local faith communities also provide a number of drop-in cafes or free meals and have been instrumental in establishing the local food bank, as well as meeting the impacts of Welfare reform. The baths were designed by A B McDonald and opened in 1917 after the architect's death. They contained hot baths in the upper storey and three swimming pools on the ground floor. There was a seating gallery around one of the pools for spectators attending events such as galas. There was also a wash-house or "steamie" at the rear of the building, which was converted to a launderette in 1971. For many years, the usage of the baths was in sharp decline, with access to the general public being severely limited by "specialist" sessions where only certain members of the paying public were allowed in, and as a general amenity they proved to be non-viable. After the council closed the baths, the campaign to save Govanhill Baths began in December January 2001 which resulted in an occupation of the building by left-wing activists from 17 March until 7 August 2001 when sheriff officers accompanied by police removed the protesters and boarded up the pool. Since then, a growing community has continued campaigning for the redevelopment and reopening of the facilities to residents of Govanhill and surrounding communities. The Govanhill Baths Community Trust organises fundraising events, sends out regular newsletters and runs the Govanhill Baths Open days in which members of the public are shown round the building for free. The baths were reported to be a venue for the Big Huge Poetry Splash in 2012, as part of National Poetry Day. ^ "Scotland's Landscape: Govanhill". BBC. Retrieved 4 November 2018. ^ Maver, Irene. "Second City of The Empire: 1830s to 1914". The Glasgow Story. Retrieved 4 March 2017. ^ "Dixon Halls". The Glasgow Story. Retrieved 4 March 2017. ^ City of Glasgow Act 1891, (54 & 55 Vict.) c. cxxx, section 4. ^ a b "Govanhill Housing Association". ^ "Dance Factory Dance Studios". ^ "Twisty-Headed Man Company". Archived from the original on 14 April 2011. ^ "Calder Street Public Baths and Washhouse (Former), 99, Calder Street, Govanhill - Buildings at Risk Register". www.buildingsatrisk.org.uk. ^ "Govanhill Baths... still afloat after 100 years". Evening Times. ^ "Govanhill Baths Community Trust". ^ "Historic Govanhill Baths awarded £1.2m lottery grant". 24 September 2015 – via www.bbc.co.uk. ^ Provan, Gillian (27 September 2012). "Writers bring poetry to life in the heart of the city's famous landmarks". STV. Archived from the original on 6 January 2013. Retrieved 27 September 2012. ^ a b c d e "WriteToThem - Choose your representative". Retrieved 3 December 2018. Wikimedia Commons has media related to Govanhill.